So I leave for New York tomorrow (actually I fly out on Sunday morning... but I leave Williams Lake tomorrow!) and I have tons of info packed into my daytimer, which I really never liked- just bought it cuz I needed one, ya know? I tried crackle painting the cover, but since it was a bit glossy it flaked right off... then I had the brilliant idea to use my QK vinyl to cover it- I just cut a piece and wrapped it around, like you would with mac-tac or something. 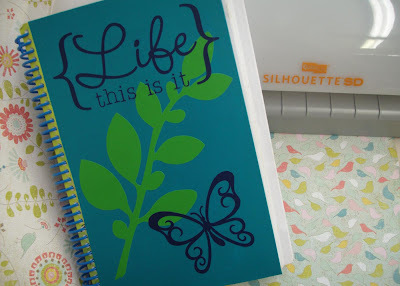 I cut a few shapes & images out with other colours of vinyl and layered them on and viola... a planner I'm happy to pull out in public :) We'll see how my little letters hold up, but it sticks great and is so easy to work with. It's fun for so much more than just walls! 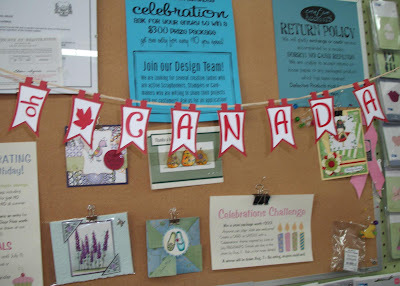 This 'Oh Canada' banner is a little project Tanya and I did when the new Silhouette SD arrived- I just had to cut *something* so I pulled out the vinyl and cut the letters and the maple leaves out. The pennants are from the Revolution die. Again, I was thrilled with how great the vinyl works with paper- I think I'll be using it on alot of projects, especially when I'm working with something detailed that would otherwise be a bother to glue down. Sorry the picture is so lousy, I just wanted to snap it quick and share!